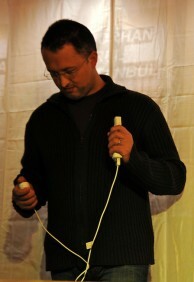 Korhan is a computer musician, improviser and sound designer based in Istanbul. He plays computer and electronics. He is a founding member of Islak Köpek, Turkey’s pioneer free improvisation group. He performed and had compositions played in radios, festivals in Turkey, Austria, Australia, Finland, Greece, Germany, Holland, Ireland, Israel, Italy, Russia and the UK. He performed telematic concerts over Skype in Germany, Spain and the US (New Mexico). Korhan approaches computer performances from a conventional instrument approach. He refrains from using many sound layers and frequency ranges in order to leave space for acoustic and electric instruments he plays with. For his solo performances, he sometimes augments the computer with other sound sources, such as analog electronics (modular synths, guitar effects, oscillators, digital effects). He plays his computer instruments similar to a conventional instrument player - the laptop is the “sound body” and the “resonators”, the controllers are the “exciters”. He uses Nintendo Wiimotes, an iPad and other MIDI controllers as the “fretboards” for his instruments. Korhan’s compositions blend industrial sounds, found sounds, abstract sound textures and acoustic instruments into sound collages.